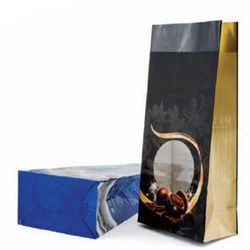 These premium block bottom bags are the ideal pre-made packaging solution for high-end products such as confectionery, biscuits, tea, coffee and cosmetics. With their unique range of decorative features, Block Bottom Bags can uniquely enhance your brand awareness. Amcor's history dates back to the 1860s when Samuel Ramsden, a young stone mason from Yorkshire, arrived in Australia with his bride to seek his fortune in a new land. He established Victoria's first paper mill on the banks of the Yarra River in Melbourne. For most of its life the company was known as APM - Australian Paper Manufacturers and its products even then touched the daily lives of all Australians. Samuel Ramsden, Founder of the company. Botany Paper Mill, Circa 1900. Amcor was the first company to collect paper for recycling with a horse and cart. The former Australian Paper Manufacturer's logo and letterhead. In the 1970s and 1980s the company added a range of diverse packaging interests to its traditional papermaking activities. This was achieved through creating new business partnerships and making strategic acquisitions in order to expand and diversify the company’s activities. With the focus gradually changing and as the company moved towards the future, the company name did not quite fit with the new focus of this young, energetic Australian company. It was decided that the company name should be changed. On May 1, 1986 APM became Amcor Limited, a name that has become increasingly well known throughout the world for its packaging innovation and its global reach.